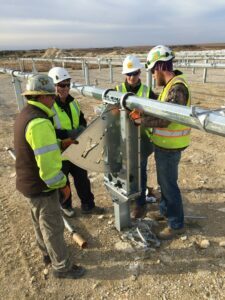 The SunPower Solar Project allowed students in Cloud County Community College’s newly created solar energy program to help design, construct and commission a large solar project as part of their Renewable Energy training. The project was a success, despite the many challenges of installing rows of solar panels over the site of an old limestone quarry. The clean energy produced will be tracked, and a portion of the cost savings will be applied to scholarships for renewable energy students, as well as decreasing the college’s ongoing utility costs for years to come. Construction of the project, which was partially funded by a grant, led to conferences and workshops being held onsite and CCCC students being commissioned to construct other solar energy projects in the area.